The method of selecting the president has evolved a great deal since the founding of the republic. The current system is much more plebiscitary (open to public input), yet, it still retains the original constitutional designs such as the Electoral College. 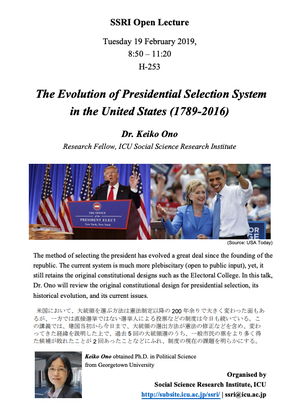 In this talk, Dr. Ono will review the original constitutional design for presidential selection, its historical evolution, and its current issues.